Englischsprachige Ausgabe des Buches „Licht und Schatten“. Übersetzt von David H. Wilson. 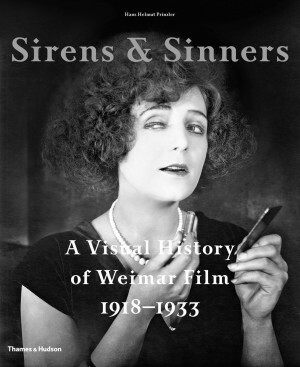 „ A lavish showcase of more than seventy films, selected to give a wide-ranging overview of Weimar cinema at its finest – from escapist comedies and musicals to gritty depictions of contemporary city life, from historical dramas to fantastical visions of the future. Between the First and Second World Wars, under the Weimar Republic, Germany became the scene for one of the most creative periods in film history. Through the silent era to the early years of sound, the visual flair and technical innovation of its filmmakers set an international standard for the possibilities of cinema as an art form, with movies such as The Cabinet of Dr Caligari, Nosferatu, Metropolis, Pandora’s Box and M building a legacy that not only shaped the world of film but also had a lasting impact on all the visual arts. The selected films give a wide-ranging overview of Weimar cinema at its finest, with daring themes such as sexuality and social issues tackled by iconic stars such as Marlene Dietrich and Louise Brooks. Beautifully reproduced film stills capture the bold visions of great directors such as Fritz Lang and Ernst Lubitsch, while the text sets the historical scene and gives an intriguing insight into what these films meant to the society that created them. The movement was brought to a close by Hitler’s rise to power in 1933. Many of the greatest directors, screenwriters and actors were forced to flee Germany, a large number making for Hollywood from where their talents were shared with the world. Hans Helmut Prinzler is a former director of the Deutsche Kinemathek in Berlin and has written widely about German cinema.